The PJ Gray Series - now available as print, eBooks, and Audio books! The PJ Gray series of thrillers centers on a psychologist and single mother who deploys virtual reality technology to solve homicides for the St. Louis Police Department. The novels in the series include Gray Matter, Fire Cracker, Chameleon, Act of Betrayal, and Time of Death. I'm also the author of Burning Rose, a stand-alone environmental mystery. Ebooks and audio books are available from Open Road Integrated Media and Audible. Previously published hardcover and paperback versions are available in limited quantities from online bookstores. 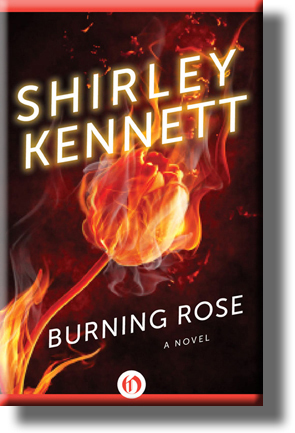 BURNING ROSE is a standalone thriller (not part of the PJ Gray series) with high stakes, exotic locations, unforgettable characters and a splash of romance! Casey Washington is a freelance eco-journalist who thinks she has the brass ring in her grasp—an interview with Robert Gunner, the reclusive head of a powerful megacorporation building a controversial hydroelectric project in an unspoiled Amazon River rainforest. When the interview goes wrong, she’s mad enough to start turning over stones and seeing what crawls out. Heads of megacorporations are dying in mysterious and gruesome ways, shifting loyalties rapidly on the international scene. A secret organization is plotting to change the balance of power. And Casey finds herself admiring the man she’s supposed to hate. It all comes together in a place where butterflies float over calm water and deadly creatures lurk underneath, where the natives slip like shadows of nature through lush forests, and killers pursue their human prey. Suddenly Casey’s got more to worry about than missing a deadline!